Earlier this month our family experienced a beautiful and blessed event of the best kind, when Tony's sister (his only sibling), Maria, gave birth to her first child: a strapping nine pound baby boy that the elated new parents named Jarno. As neither of my own siblings have kids of their own yet, this wee lad (pictured below) instantly turned Tony into and Uncle and myself in an aunt for the first time. Needless to say, we're both elated to have these important roles bestowed upon us! Though our nephew and his parents live in Italy and we're in Canada, thanks to the power of modern technology, we'll be able to watch this sweet little tyke (who totally looks like his Uncle Tony!) grow up and definitely hope that occasional visits will be possible over the years, too. In the spirit of Jarno's birth, as well as the fact that springtime itself is the universal season of rebirth and new life, I thought it would be oodles of fun to share some of the super cute genuine vintage baby, toddler and young children appropriate items - a mix of clothing, accessories, toys, decor and other charming pieces for little ones - that have been crossing my path lately online. It is not uncommon, at any given point in time, for many of us to know someone who is expecting, just gave birth, and/or has young kids of their own (or you may even be in this wonderful group yourself), so while very few of these items will fit grownups, they're fabulous for all the smallest recipients on your gift giving list! 1. Preciously lovely and pretty as a picture, this tiny mid-century vintage pink knit set features a cardigan style sweater and matching hat/bonnet with pink satin ribbon ties, and is sure to melt your heart! $14.25 for both garments from 42nd Avenue Vintage. 2. Springtime perfect pastel hues and fun embroidered animal designs call this lovely pair of 1970s gingham baby burp cloths home, and elevate this utilitarian item into something extra sweet and special. $12.00 for the pair from Starr Child Vintage. 3. File this one under the "I can't even" header, because, seriously, I can't even...A teeny, tiny mid-century vintage Mexican tourist jacket. If that isn't the epitome of old school cool, I don't know what is! $45.00 from Ms. Tips. 4. Bursting with mid-century charm, this adorable pair of matching Plankie brand plastic baby rattles are just as cute as decor pieces (in the nursery or elsewhere) as they are functional, if you wanted to give them to a wee-est one in your family. $18.00 for the pair from Milkweed Vintage Home. 5. Ideal for little ladies or gents alike, these soft-as-a-lamb's tail mid-century small children's sized deadstock vintage gloves are ideal for springtime and would be especially charming sported by a wee one for church or a party on Easter Sunday. $12.50 from Chronically Vintage. 6. I can just imagine what a fascinating read this recipe and information booklet called Feeding The Child For Health, dated 1935, must make for. No doubt plenty has changed since it was penned, but I'm sure a fair amount still rings true 81 years later. $8.00 from Openslate Books. 7. Fantastic for spring and summer - or if you're taking baby on a holiday during the nippier months - this fun, animal print vintage child's top is geared towards those around twelve months old and is sure to garner compliments and "awws" whenever its worn. $15.00 from Salvage House. 8. Wonderful for a nursery, play room, craft space, home library or anywhere you fancy, this beautiful pair of mid-century wooden wall art plaques have an old school fairy tale theme to them and will continue to suit little ones as they grow up. $16.00 for the pair from Happy Day Antique. 9. Almost too cute to use as anything but a decor piece, this marvelously fun little c. 1940s embroidered baby shoe holder would make for such a fantastic baby shower gift, especially if the mom-to-be is a vintage fan. $26.00 from Shabby Shop Girls. 10. Homemade knits and infants go together like childhood and toys, so why not whip up something for the wee ones in your circle with these delightful c. 1951 knitting pattern book of handknits for babies. $5.00 from OldPatterns.com. 11. Sometimes there's simply no beating a true classic and that's what this immensely lovely little mid-century Raggedy Ann doll is (so presh!). $12.00 from What's New On The Mantel. 12. Timelessly lovely and very practical, these sophisticated vintage brown leather toddler boots are so stylish, you'll wish for a pair in your size, too! :) $30.00 from Jade and Lauren JR.
13. If ever there was a fabulous little outfit for a baby's first spring and summer, this cheerfully hued plaid and flower vintage sunsuit is it! $14.00 for dress/blouse and bloomers from USA's Kids. 14. An ideal gift for the special soon-to-be parents in your life, this sophisticated vintage StorKraft baby fork and spoon set is still in its original box and features easy to hold curved handles, perfect for little hands as baby begins to feed him or herself. $42.00 from Sunny Day Vintage. 15. 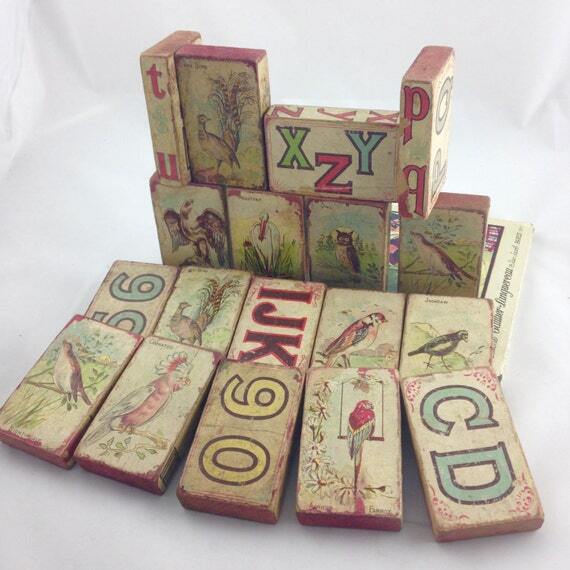 As much tiny works of art as they are timeless playthings, these gorgeous turn of the last century children's wooden blocks could easily be used as nursery, childhood room, and even adult bedroom decor, as the little whippersnapper continues grows up. $65.00 for 18 pieces from Milkweed Vintage Home. 16. Vintage and antique children's garments and accessories never fail to make me smile and wish that (more) children still dressed in those sorts of wonderful yesteryear styles. One has only to look at this fantastic c. 1960s little girl's navy blue and pink, for example, to instantly see why such is the case for a vintage fashion fan like myself. $38.00 from Ruby and June. 17. Who amongst us doesn't fondly remember the first suitcase we had as a small child? I can clearly picture mine (it was in shades of lilac-y purple) and I felt like such a sophisticated globe trotter each time I packed it up for a weekend at Grandma's house or a family road trip. Relive some of those fun memories with this sweetly illustrated (Easter time perfect) tiny vintage children's suitcase, that could easily be used as a storage and/or decorative piece around the house, too. $32.00 from Chocolate For The Soul. 18. An ideal baby shower, birthday, or holiday gift, this lovely little vintage baby comb and brush set comes complete with its original heart shaped packaging and would thus be an especially nice choice for Valentine's Day. $12.00 from Caprock Baby. 19. Almost too pretty to actually use, this kitty cat embroidered and quilted butter yellow baby's bib is chocked full of loveliness and yesteryear style. $9.00 from The Turtle and The Ray. 20. Childhood just wouldn't be the same without things like nursery rhymes and fairy tales, and when it comes to such, you just can't beat a beloved classic like this 1957 take on the age old tale of Mother Goose. $12.00 from Atty's Sprout Vintage. 21. Is this enchantingly sweet mid-century vintage ceramic angel themed light switch cover not one of the most precious things you've ever laid your eyes on? I'm utterly in love with it and can't imagine a more charming piece to use in a nursery. $28.00 from Caprock Baby. 22. How fabulously cute + pretty + fun is this great mid-century three-piece vintage children's dishware set? From the punchy hues to the terrific illustrations, its practically impossible not to fall in love with it at first sight! $25.99 from Left Lane Vintage. 23. These are, undoubtedly, some of these most adorable vintage baby booties I've ever come across. Fluffy pink mohair and whimsical little kitty cat appliqués team up to create a pint sized footwear pair that is off-the-charts sweet! $32.00 from West Egg Vintage. 24. And for even more cat cuteness, playful little embroidered kitties top this immensely sweet 1950s cotton crib blanket that would also work wonderfully as a cover atop baby while using a rocking chair. $34.00 from Atty's Sprout Vintage. 25. I absolute adore overalls, especially on children, and have fond memories of my own pairs from when I was knee high to a sandbox. This awesome pair of 1950s deadstock blue overalls with coordinating blue short sleeved shirt is as classic and sweet as they come, and would look so cute for a photo shoot starring baby and daddy. $36.00 for both garments from Salvage House. Plus a bonus 26th item that is geared towards all the stylish vintage adoring mamas out there! 26. Classic, elegant and ideal for Mother's Day gift giving, this beautiful gold tone metal and goldstone brooch is an ideal way to quite literally keep one's love for their children close to their heart. $12.50 from Chronically Vintage. I was ecstatic when I found out that Maria was pregnant and even though we were thousands upon thousands of miles apart the whole time, I adored hearing about how the experience was unfolding for her and her partner. I know that she'll be an excellent mother and that Jarno will grow up in a home with love and happiness - which, ultimately, is the best gift any child can ever receive. There's definitely a surreal quality to thinking of myself as Aunt - or, in Italian - Zia - Jess and it melts my heart to picture the first time, down the road, that I hear sweet Jarno call me such. As detailed here, late January and much of February were rocky times for us, so in launching March (and by extension spring itself) off on such an incredibly wonderful note, I can't help but think that things have turned around and that the sun - both literally and metaphorically - is smiling upon our family once more. Such a sweet list, really brings back lovely memories. Thank you. Aww, you're sincerely welcome. I'm a huge nostalgist myself and was taking quite the (Fisher Price toy strewn) walk down memory lane while penning this post. 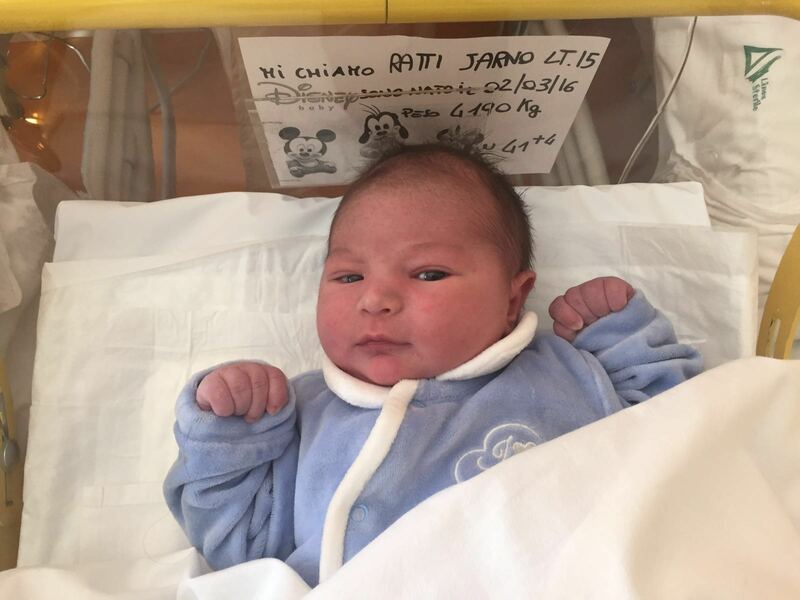 Welcome little Jarno! And best wishes to the newly uncles! This baby has a look that says: Jessica When you come visit me? heheh now you have a new, beautiful reason to come to Italy, in addition pcs to meet me! Other than that .. you're right, the technology helps it feel closer! P.S. how many nice things! I love the vintage toys, but I blame .. when I was little I've ruined the beautiful toys 50 years of my father. Now they are so regretted! Ooohh, doesn't he though? There's a real spark of curiosity behind those dark eyes and I can hardly wait until the day his Zio and Zia from Canada can pay him a visit. Don't beat yourself up. I'm sure millions upon millions of other children have worn out their parents toys, too. A toy is to be enjoyed first and foremost and if you did so with your dad's, then they didn't "die", so to speak, in vain. :) That's super sweet, thank you so much! It's been two week since Jarno was born and the elation in my heart over his birth hasn't subsided one iota. Honestly, I hope that it never does. Thank you very much, dear lady! It hasn't quite sunk in entirely yet that I now have this wonderful title in front of my name. What an honour and joy it is to wear the crown of "Auntie". Thank you deeply, dear Emily. It's hard to adequately express my happiness at the moment. Even though I've not yet held this precious bundle of joy in my arms, I love him fiercely and can scarcely wait for the day when we first meet (no idea yet when that will be, but hopefully not too terribly far in the future). I love knowing that this cheerful post brought a wealth of positive memories your way. I was filled with many, including of when my own siblings were little, while writing it, though not, I'm certain, like the incredible ones you have as a mom. How fantastic that you have two children of your own, Emily. I'm sure they must be amazing kids, because their mom is one of the sweetest, kindest, most caring people I've ever encountered. Being an aunt is great! I love my nieces and newphews ! Everyhing is very pretty BUT that mexican jacket is SUPER cute!! It really is! Granted I'm quite the newbie there, but I always hugely looked up to my aunts and hope that Jarno will see me in much the same light and always know how dear to my heart that he is. It really is! I don't have anything to compare it to really and am truly floating on cloud nine this month. No matter what the day brings my way, I have only to think of this sweet little pumpkin and my mood instantly perks back up. Congrats to aunt Jessica and uncle Tony :) on the new addition to the family. Thank you very much, lovely Lorena. We, like his proud parents, couldn't be more elated. This is definitely a March I'll never forget! You're so sweet, Rhiannon, thank you very much. I adore putting posts like this together and appreciate your kind words regarding them a lot (so encouraging!). They usually take anywhere from (good chunks of) 1 - 4 days. I like to inject diversity, both within a given post itself and (to a degree) from one "shopping roundup" entry to the other and to feature items that, for the most part, really spark something in me personally. Good to know about bypassing vintage bibs. Thank you for sharing that. Have a splendid countdown to the start of spring! Your nephew is precious! Congratulations Zia Jess! And how cute are those vintage baby items- just love it! Thank you sweetly, my dear. It is one of the most exciting things I've ever experienced and I haven't come down off cloud nine over it all month. Such cute pieces, I especially love the blocks and the suitcase. Congratulations on the birth of your nephew, he is very cute! Those blocks are just fantastic, I agree, and the suitcase is so charming and nostalgic. Great favourites from today's post, sweet Kelly. Thank you so much! He really is a cutie pie! I see such a twinkle in those eyes and really can't get over how much he resembles my husband. That child could easily be his own based on appearances. It's great that they share that further bond (of looking similar, I mean) in common. Congratulations on becoming an aunt! :D Vintage baby clothes are so darn cute. These are such lovely gift ideas - I would want all of them if I were a Mother! Congratulations on your new nephew, he is really scrummy! Congratulations on the new addition to your family! You must be so excited. I'm not totally sold on having children myself, but I would really love the be an aunt. I'd love to have a hand in raising a child and teaching them about books and fashion and music, without all the stress of being solely responsible for their well-being. It's hard to look at baby stuff objectively - it's all so cute! I do love those adorable little furry booties, though. Goodness, isn't it though! I have a huge soft spot for baby and children's items. They blend cuteness and nostalgia so endearingly. I'm truly excited - it's a feeling unlike any I've ever experienced before. I can hardly wait until we finally get to see the little cutie pie in person, whenever that may be. Congrats! My favorite job is that of Auntie. That's truly awesome! It's still a bit surreal to think of myself as an aunt. It's a role I already treasure and I hope that as he grows, even with an ocean between us, Jarno and I will be close. That sweater and hat are so cute. So are a lot of other things here, but that is certainly my favorite. They really are super charming! Vintage children's clothing is endlessly sweet. Many thanks for your comment, sweet lady. I hope you're having a great week! Awwww....little Jarno. Congratulations on your auntiehood. I just go goo goo gaga over vintage children's things. It's almost like I was a child in the olden days. Oh wait. I was!!! Adorable stuff! Too cute! I bet you were an over-the-moon adorable baby, dear Connie. I was born in the 80s, but I feel like a lot of my toys were more in line with those of the mid-century than what kids today play with, especially since many were hand-me-downs from my grandparents from when their own kids were little (and gosh, did I adore those toys, games, books, etc). fabulous and sweet collection here my dear! some of the styles i remember from my own childhood! Can't you though? The similarity is just uncanny! I sense a lot of intelligence behind those dark eyes - another point they'll have in common. Those burp clothes are too adorable! Some of these things remind me of knick-knacks and blankets and stuff from around the bedroom when I was growing up--not too surprising as most of what I had as a baby came from my grandmas' houses--stuff they'd used with their own kids. Congrats to your family!! It's very exciting to be an aunt! We have one nephew also, and though we don't get to see him often, we love all the photos and videos and Skype calls we can get with that little boy! Thank you very much, my fellow auntie. It's awesome that you have a nephew, too. Three huge cheers for the power of modern technology. Helping families stay in touch is hands down one of its strongest benefits. I'm going to be an aunt for the first time this year too, and I'm so excited. Poor little scrap won't know what hit it, as my parents and their partners are all over the moon about it too, it'll be treated like a little Emperor/Empress. Though being Sensible Aunty Mim, I'm planning to put money into its college fund from the start; it'll be up to its ears in toys anyhow. Thank you very much, sweet Mim. It's super exciting that you're going to be a first time aunt soon, too. The feeling is unlike anything I've experienced before. There's a maternal instinct big time, swirled with happiness and pride, as well as a strong sense of protection. I'm sure you'll be off-the-charts happy, too and can't wait to hear more about your own precious little nephew. Congratulations "auntie" Jessica! Vintage baby things are so cute. I keep coming across them but we don't have any small children in the family. That is, not yet, as - if all goes well - I will be a step-granny this autumn. Oh my goodness! So many cute tiny things! Great round-up - and congrats, Auntie! Thank you sweetly, dear Nikki. I can't believe how happy I am this month because of little Jarno's birth. It's an amazing feeling and one that I hope everybody gets to experience in their lifetime. Awesome assessment of Jarno's expression. I sense such intelligence, mischief and wonder behind those dark eyes of his. It's just amazing how much he resembles his Uncle Tony. I wonder how many other similarities these two Cangiano men will share in common as time goes on. Big hugs & happy (almost) springtime wishes! Congratulations on becoming an auntie. I have kind of surprised myself by how much I love being an auntie and it is so interesting watching them develop. You have picked a lovely selection of things, the wooden blocks and the lamb suitcase I would happily have in my home. I like the embroidered cat bib and cot blanket. That Mexican tourist jacket though!? Wow! Thank you so much, my dear friend. It's such an amazing feeling and even more extraordinary roll. I feel honoured to be an aunt and really, truly look forward to watching this little bundle of joy grow up. Thank you very much, dear lady. You're so sweet! I'm thrilled to say that everyone, new parents included, is doing great. Jarno is happy, healthy, and thriving, complete with a good appetite. We're so blessed as a family and all in the highest of spirits at the moment. Such congratulations! Little Jarno is adorable! Being an Aunt is rather wonderful although suddenly having a reason to buy cute baby things can be dangerous. As can being a Mum! This list you have put together is fabulous. Teacup already has a small collection of vintage gloves, thanks to my best friend, for when she is older. And some books, toys and blankets from my childhood of course. We have also had a quick dress up in her great-grandmother's baby dresses, sewn by *her* grandmother! I just adore that Teacup has some vintage gloves already. That's really special! Have you made her any tiny hats yet or is she still a bit too young for such? Congratulations on becoming an aunt! Love these vintage baby items you've picked out! Thank you very much, honey. It really has been one of the most exciting things to happen to me in ages and more over, one of the best. I can hardly wait to watch Jarno grow up and be as much a part of his life as I can from this side of the world. He's so cute! Congratulations to you guys! How wonderful that you were able to breath new life into them. That's such a sweet story. I have a tiny number of items from when I was a baby and they're some of my most prized possessions. Thank you for your lovely comments this weekend. I hope that you're having a great one! Isn't it uncanny? I'm so curious to see if they remain similar looking as he ages or not. Interestingly, Tony has an uncle who he's a dead ringer for, so if Jarno carried on the tradition, that would just be too cool! Thank you sweetly, lovely Melanie. I fully understand that (I'm infertile myself) and have a teeny number of items from when I was a baby, too. I feel so glad that I do, as a lot of items from my youth were lost to the hands of times (and numerous moves) early on in my life. It would be wonderful to use them on a child of my own, of course, but even if that never happens, I'll still just enjoy knowing that they were able to stay with me throughout (hopefully!) my whole life. Your nephew is sooo cute! I hope you'll get the chance to travel to Italy to get to know in person this little lad :-) Eva (from Luxembourg/Germany). Thank you very much, my dear friend. I really, wholeheartedly hope so as well. It would be wonderful if we could make it over there at least once every few years, so that Jarno got to know us better in person - and also for Tony to get to reconnect more often with his homeland.